Commissioned for a sailboat aficionado! Shawna paints the special moments of life that connect us to our story. She works in both acrylic and watercolour mediums. Each painting is created with the highest quality archival paints and materials. Your painting is an heirloom to be enjoyed for generations. What better way to celebrate those special people in your life than by giving them a gift of art! Purchasing a Shawna Lampi-Legaree original is an easy process. If the piece you are interested in is available just click on the BUY NOW button below the painting. All major credit cards are accepted through Pay Pal ensuring a fast and very secure transaction. If you would like to discuss other payment options please call Shawna at 867.920.4290 or email her at dancingravenstudio@gmail.com. She would love to talk to you about the paintings and answer any questions you may have. Shawna has a 100% satisfaction guarantee policy. You have 14 days to return the painting (must be in perfect condition) for a full refund minus the paypal fee, shipping and handling costs. Shawna also offers commissions. Through her commission paintings she uses your unique items in creative ways to tell an individual story. Just send her an email note (or call) to discuss the best options for your painting. Shawna will involve you during the entire process. She will provide a preliminary sketch for your approval. Once you approve the sketch, a 50% deposit is required to covers material and other costs. The remaining balance is due when the painting has been completed. The range of ideas (and most themes you might suggest of your own) are listed below. Celebrate a new life in your family with a painting that reflects a favourite toy or book from your childhood or one that you gave to your children when they were young. Shawna can create a still life that is unique to you. Looking for a fun way to “pop” the question! Shawna will work with you to design the ‘perfect’ painting for you to ask that all important life-changing question. Got a Collector in your life? Shawna can take a range of collectibles and create a painting that will be the perfect gift for the recipient. Imagine a painting of those special books, coins, stamps or other collectables. Have an absolute favourite flower? 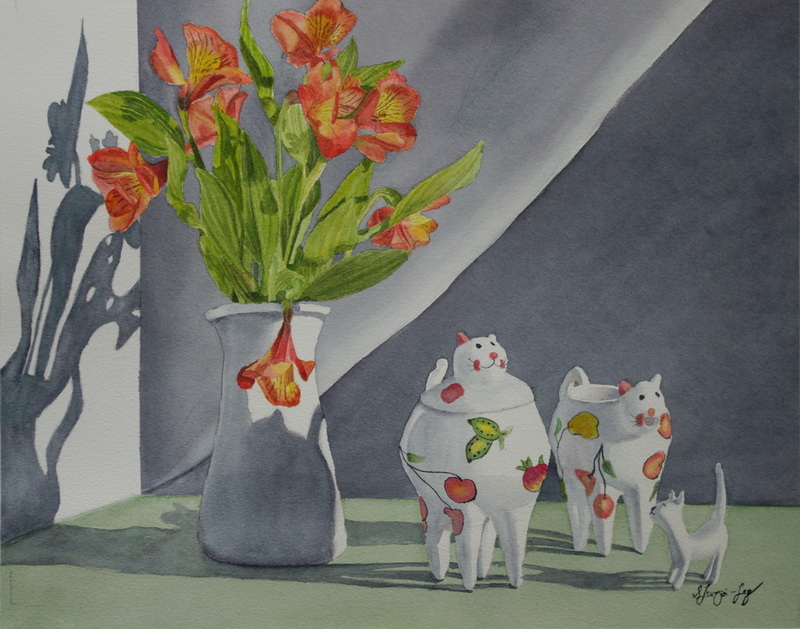 Shawna excels at florals in watercolour. Shawna will photograph and paint most any flower that you want. Memorialize someone who was special to you. This work is the most precious as it celebrates a lifetime with the most significant personal items. Shawna’s unique ability to render these paintings will add something special to your home. The above sizes are just suggestions. Shipping cost in Canada will be approximately $35 + or – depending on the size, insurance is included in the price of the painting. I will ship internationally. All rights to the paintings are owned by the artist, Shawna Lampi-Legaree. Commission to celebrate Zach's arrival! This painting was commissioned for a Cat Lover! "Robertson Davies' Whore", Commissioned by a peony lover! These paintings were commissioned to celebrate the most loved early childhood toys of a father and son. The photos on this page are commissions that Shawna has completed.